To finish out the Ruth series, we’ll take a look at Chapter 4. We see the chapter begin with Boaz meeting with the one man who is obligated by law to be Ruth’s kinsman redeemer. After asking if this man will redeem the land, he quickly finds that the man is willing to purchase the land, but is not willing to take in Ruth and her mother-in-law with the land. At this point, we see this man is falling into the temptation of trusting in himself and his riches. The man notes, “I cannot redeem it for myself, lest I impair my own inheritance.” He was fearful of bringing Ruth in, because at the heart of it he didn’t trust that God would provide for him and his family. In response to this, Boaz responds in faith. Even though he wasn’t obligated, he trusted in God and stepped out in faith to redeem Ruth and her mother-in-law. What’s amazing is what happens next. The elders in 4:11 give a blessing that Ruth would be like Rachel and Leah, who built up the house of Israel. This blessing becomes a reality. We see that God doesn’t just provide provision for Ruth and Naomi, but he blesses them by allowing them to be part of the greatest redemption story in all of mankind. How? We see that the son of Ruth and Boaz became the father of Jesse, who became the father of David, and from this lineage came our Redeemer, Jesus. Can you imagine the type of God we serve that would include a Moabite widow in the story of his redemption? Can you imagine the story God has for you if you place your trust in him? 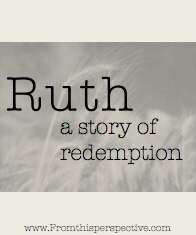 The story of Ruth reminds us once again that God’s love never fails, never gives up, and always integrates us into a larger story of redemption.